Is there anything wrong with this? 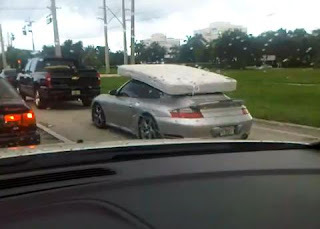 Here we have a older generation Porsche 911 Turbo carrying an unwanted mattress in an upmarket area somewhere in the U.S.
Bloggers who have watched this video have criticised the idea of a sports car carrying a mattress, but what's actually wrong with it? Even the rich are cost-cutting. If you're watching this video at work, watch out for the unneeded profanity by the commentator in the video.